There is no food I love more than bread from the local farmers market (wholemeal spelt incase you were wondering), but storage and longevity are two issues I was having problems with. I have one loaf of bread, for one person and I need it to last 7 days. I'm not picky, I'll eat stale bread.. but by the 5th day my bread would often reach what I call - 'the teeth breaking stage'. Unpackaged bread without preservatives will generally last 2-3 days before starting to show signs of going stale. The darker breads and sourdoughs tend to last a little longer. I have not had to throw away any bread since I began using the tips below. It is worth noting that pre-slicing and freezing bread is a great way to make it last longer, using only the amount that you require at any given time. The freezer temperatures stop starch retrogradation, holding the bread in a stable state. This is great for people who don't eat bread often and want to make one loaf last a very long time. The tips below are for people who eat bread often, who want bread storage to maintain the proper crumb and crust texture of their loaf and to avoid the bread going so hard it can cause broken teeth. Up to 30% of food we buy is wasted, at an estimated national cost of $5 billion-plus a year. Cut down on waste by not letting food go out of date, avoiding over-catering and looking after any leftovers. Bread should be stored in an air-tight container, but still have some room to breath. Any kind of tin or bread box will work, as long as the lid fits tightly enough to keep air out. Not all of us will have a tin or a bread box on hand, as such it's worth looking into purchasing a cloth bread bag. You can make one yourself with canvas using a tutorial like this one: Make your own bread bag. 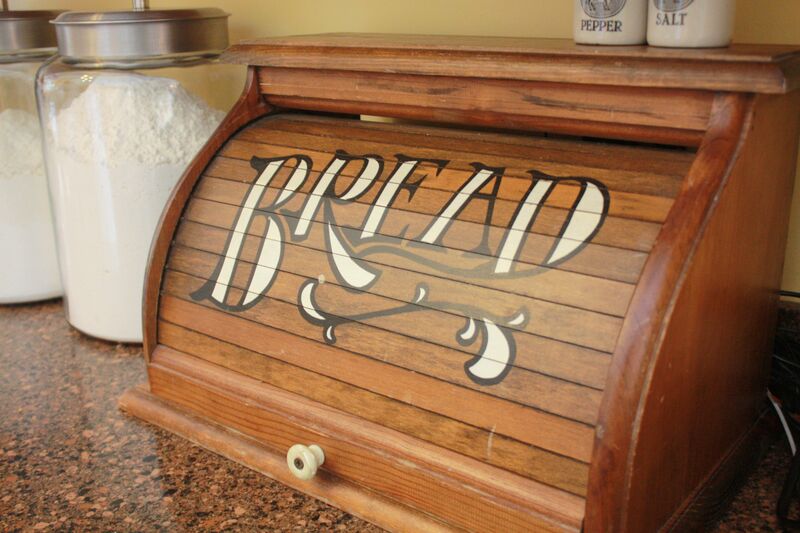 Bread lasts best when it is kept out of direct sunlight and stored in a cool, dark location- enter the humble bread box. It can also be used as an extra precaution in conjunction with a bread bag. Hard-crusted breads store well in a paper bag, just the way you receive them at the bakery/markets. Keep out of direct sunlight and fold the bag over tightly after it has been opened. If you have a loaf of bread that has begun to go 'rubbery', heating it in the oven for a few minutes will help to draw the moisture out. Do this before making a sandwich past day 5. Just a little FYI: artisan breads should not be stored in the refrigerator, they get stale and, when wrapped in plastic, will mold faster.